In October 1806—just months after the first British invasion of Buenos Aires—the victorious Compañía de Granaderos Voluntários de Infantería was split for easier management. 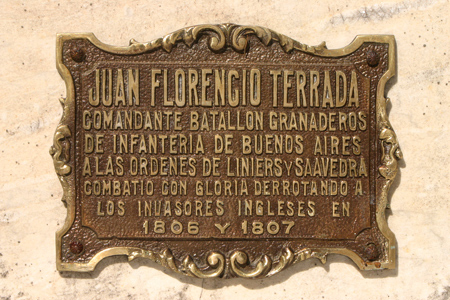 Captain Juan Florencio Terrada commanded the newly created, 350 member Compañía de Granaderos Provinciales since he had bravely commanded troops under Liniers. Terrada saw battle again during the second British invasion the following year. 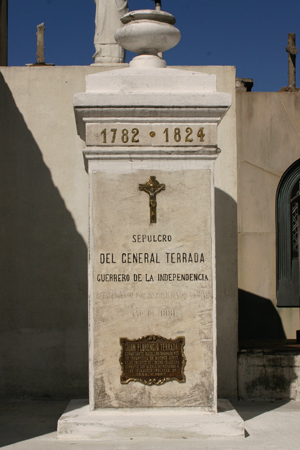 Continuing to move up politically as well as within the military, Terrada accepted appointment as the first Governor-Mayor (Gobernador Intendente) of Mendoza province in 1814. A later post as Minister of War gave him the responsibility of assisting José de San Martín prepare troops for the independence of Chile. Terrada married María Mármol, aunt of José Mármol. José took refuge in the Terrada estate in San Isidro before spending years in exile in Montevideo. Terrada passed away in 1824, & this crypt was declared a national historic monument in 1946.